Stanley Ipkiss is a shy and gentle-hearted man until he wore the Mask of Loki, that is. Loki is the god of mischief for a reason. When Stanley wears the mask, his alter-ego The Mask appears and wreaks both havoc and fun throughout the city. He’s a fun-loving dude whose short attention span mostly ruins any heroic deed he’s previously done. The Mask looks very unique. He has a bright green, bald face and he wears a bright yellow zoot suit. For this outfit, let’s modernize a bit and bring a little elegance to The Mask’s comic attire. Change the zoot suit to a modern three-piece suit and wear a sleek fedora to top of it and voila! Here’s everything you need to look like The Mask. 1 White Dress Shirt To dress classy, you will need a crisp white dress shirt underneath your coat. 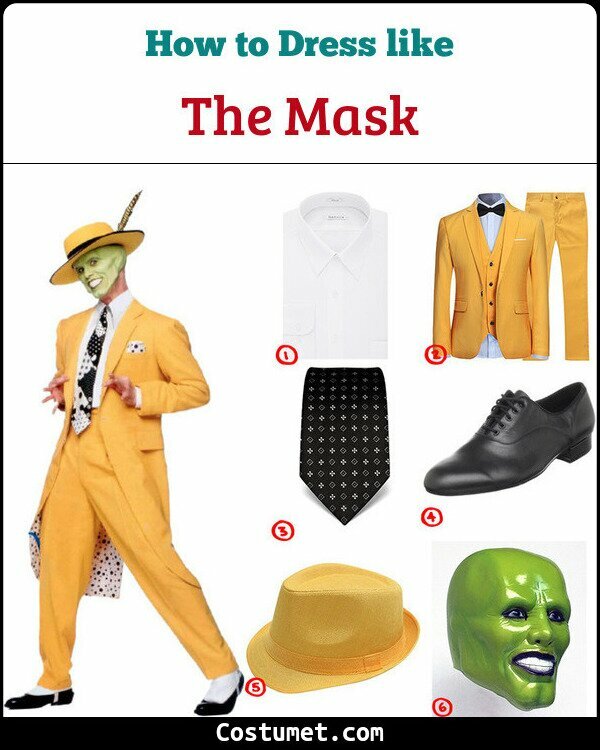 2 Yellow Three-Piece Suit Take The Mask’s iconic yellow color and put it on a three-piece suit to look dashing. 3 Black and White Patterned Necktie A patterned black necktie is the next thing off your outfit checklist. 4 Black Dancing Shoes The Mask loves partying and dancing so wear a pair of black dancing shoes. 5 Yellow Fedora Put on a bright yellow fedora to finish the debonair look. 6 ‘The Mask’ Mask Don’t forget to wear your Mask. 7 Full Costume Set If you want to go classic, you can always buy this costume set. The Mask and Stanley Ipkiss are portrayed by Canadian comedian Jim Carrey. Ace Ventura’s outfit is a Hawaiian shirt unbuttoned over a white tank top which he pairs with a red and black-striped pair of pants. Quailman wears Doug’s usual cargo shorts and green vest getup with the addition of a big red ‘Q’ written on his top and his white briefs worn above his bottoms. For this outfit, Clark Kent is wearing his typical reporter-style clothes but with his secret out in the open (psst, it’s his Superman shirt! ).